30th anniversary party ideas need to have no regrets, you may have had a big party for your 25th but that is no reason not to have a party for your 30th. Anyway that was 5 years ago and that is long enough to wait for the next big party! If you did have a party for your 25th anniversary there may have been things that you would have done differently, it could be that you want to make sure all of your family are there or that you have a great band playing. Whatever it is that you wished you had had for the last big anniversary or even your wedding try and make sure you have it for your 30th anniversary party. Your 30th is traditionally celebrated with pearls and this is a pretty theme for your party. You can decorate your party with big pearl balloons and white paper lanterns, these look great all tied in one line across the room. If you have walls that you want to decorate, you can use fairy lights and white tulle in front to give a soft pearl glow to the room. Your centerpieces could be as easy as balloons tied in bunches and secured to the table using a balloon weight. For a classic centerpiece use a candelabra with pearl candles. Or for a more modern candle centerpiece you could have floating candles in a glass bowl with pearl glass beads at the base. Or a white pillar candle with pearl beads attached around the candle. Pearl anniversary flowers can be white roses, tulips, carnations, calla lillies, lillies, white lilac, Lily of the Valley and the anniversary flowers for your 30th anniversary are sweet peas. 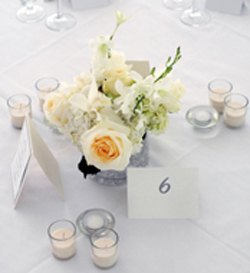 There is quite a choice there to make some stunning flower centerpieces. Your invitations will be fairly easy to find as there are many designs in pearl colors. Or you could look at making your own by printing on pearl colored card. Although traditionally the symbol for your 30th wedding anniversary is pearls it doesn't mean that all your party ideas have to be pearl colored. Another idea to use as your theme is yourselves and by that I mean use photographs from the past 30 years. You can have copies of your wedding photographs displayed in one area and then use the past 3 decades as a theme for other areas of your party. Eighties, nineties and the noughties or naughties depending on the style of your party! Everyone loves looking at old photos and remembering things that have happened, it really will be a day of celebrations. You can even use the photographs of you both on the front of your party invitations, maybe from your wedding or from now.